Progress is made not only by looking to the future, but by learning from the past. In a world so technologically advanced that heart rates are shared with the flick of a wristband and doctors can identify disease through a single gene, mankind is still faced with the fundamental questions of how do you end pain, postpone death and create a better life. Season two of Cinemax’s The Knick spotlights a range of social issues that existed in America during the 1900's. 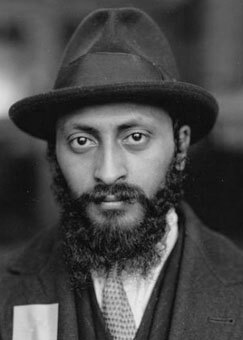 These social conflicts, which were prominent in New York City at the turn of the last century, still remain an issue today. 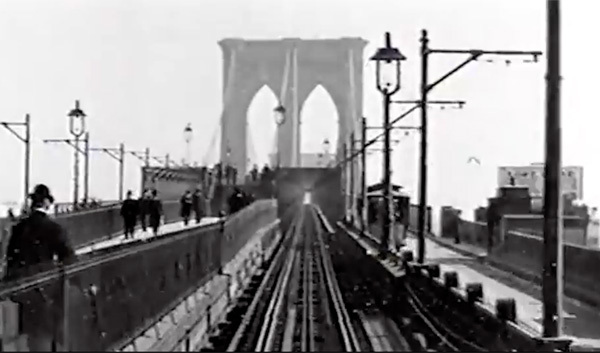 The turn of the 20th century saw one of the largest movements of humanity in the history of the world. In the 30 years between 1892 and 1924, 14 million people passed through New York City&apos;s Ellis Island to enter the United States. 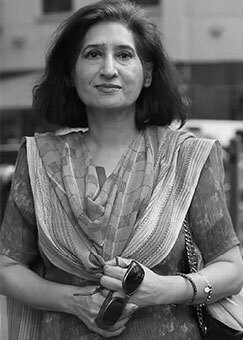 Often carrying just a single bag on their back, immigrants were absorbed into a rapidly industrializing society. 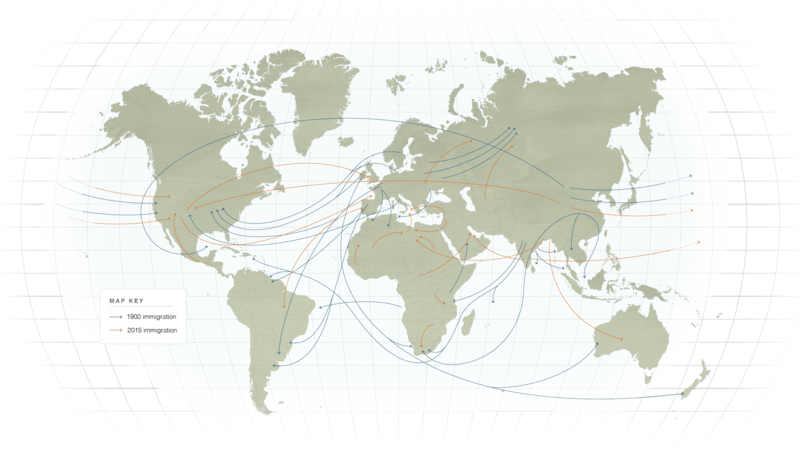 In 2014, nearly 60 million people were forcibly displaced worldwide. If these refugees, internally displaced persons and asylum seekers were to make up a nation, it would be larger than South Africa and slightly smaller than Italy. 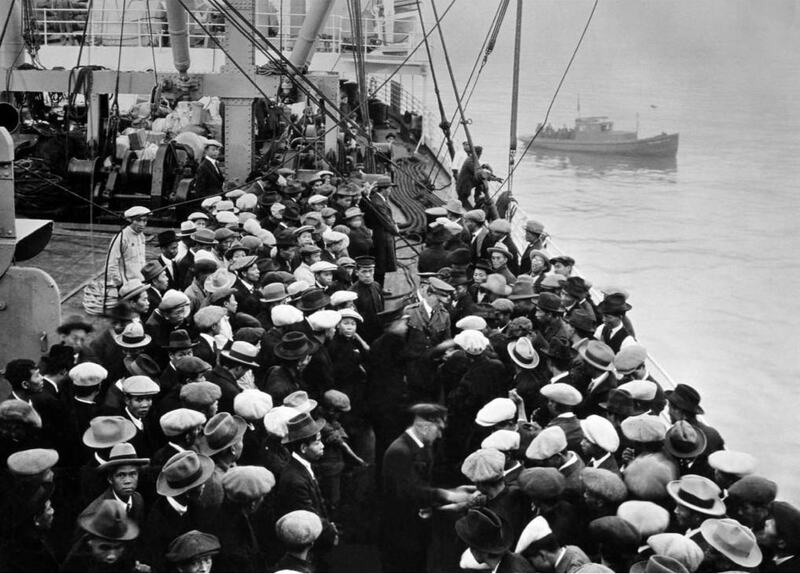 One hundred years ago, immigrants crossed the Atlantic Ocean in the hopes of finding opportunity in the New World. Today, though the destinations may have changed, the search for a new beginning remains. Whether it’s the pull of progress, the promise of peace or the simple need to survive, more people are moving today than ever recorded. Every two seconds someone is forced from their home because of conflict or persecution. 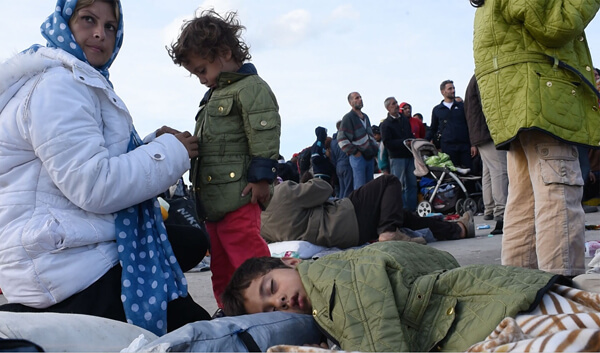 The largest refugee crisis since World War II is sweeping the globe as hundreds of thousands of people flee war-torn and impoverished countries searching for a better life in Western Europe. 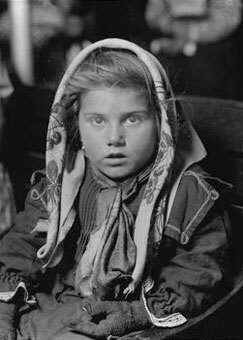 A century ago, over 70 percent of immigrants coming to America were from Eastern and Southern Europe. 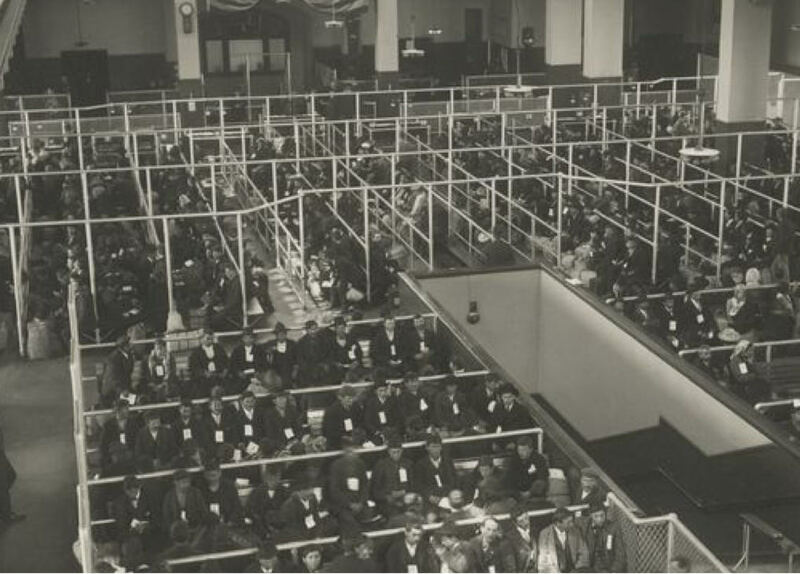 Once they arrived at Ellis Island they were herded into a temporary reception hall to be tested for disease. Although the organized process has changed, the stories from now look strikingly similar to the stories of then. 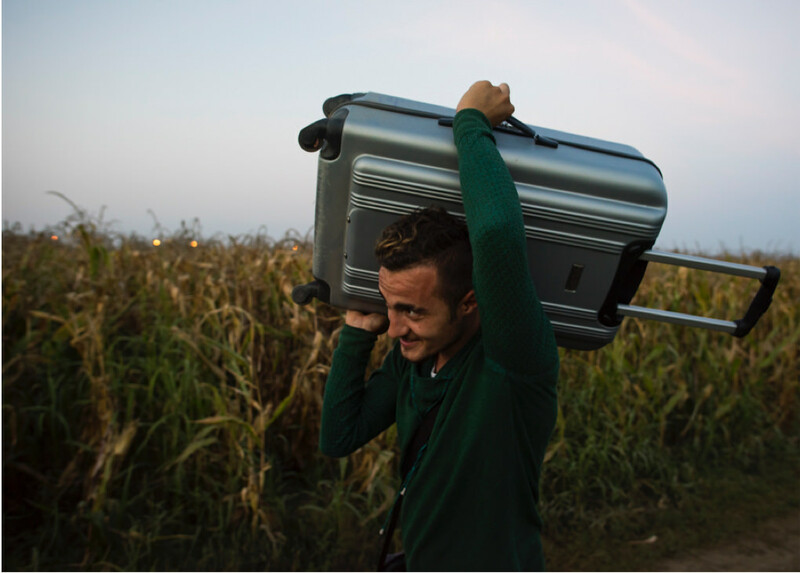 Photojournalist Pete Kiehart has been documenting refugees as they encountered an abruptly-closed border between Serbia and Hungary, crossed through dusty fields into Croatia, and arrived in Austria where some plan to settle. 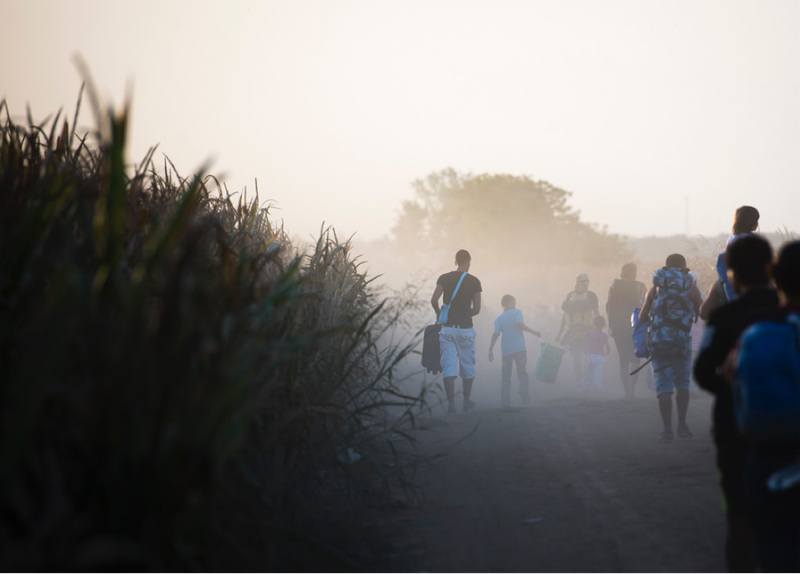 Left: Arriving at Ellis Island Right: Migrants walk through cornfields west of Sid, Serbia towards the Croatian town of Tovarnik on September 17, 2015. 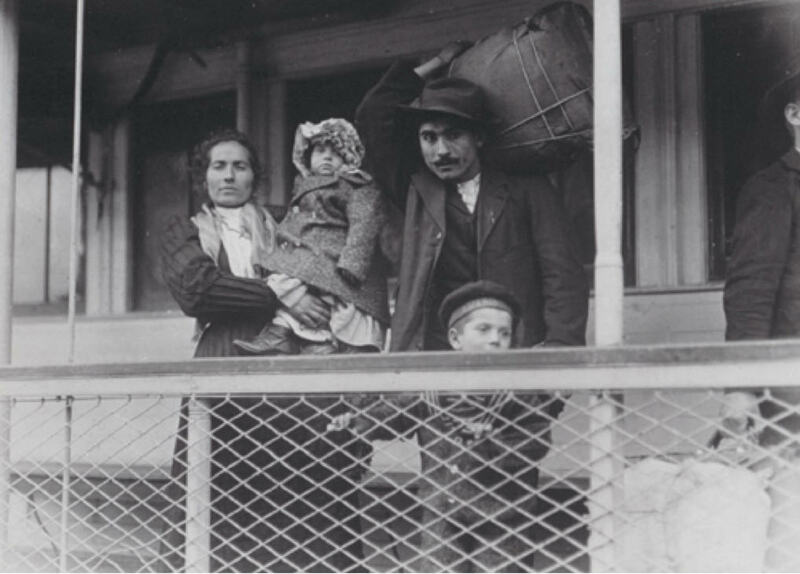 Left: June 8, 1903: The S.S. Batavia carried 2,584 immigrants to Ellis Island. This ship set a record for the greatest number of passengers to arrive at New York City at one time. 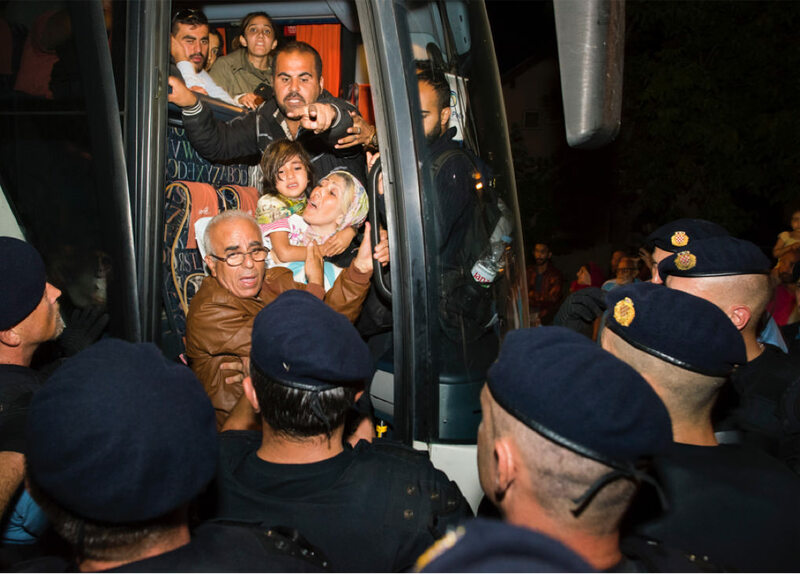 Right: Migrants plead for family members to be added to their buses, which are heading west, on September 18, 2015 in Tovarnik, Croatia. 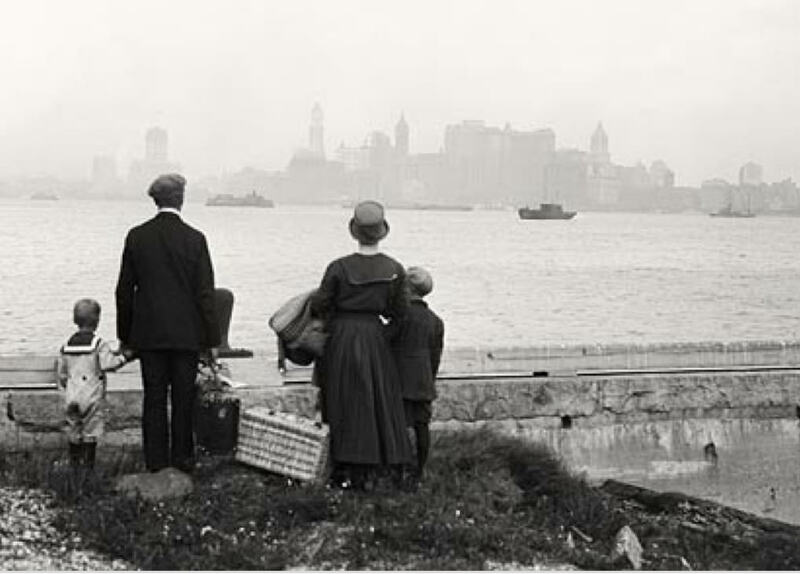 Left: Aug 13, 1925: An immigrant family on the dock at Ellis Island just after passing rigid examination for entry into the “land of promise” looking hopefully at New York’s skyline while awaiting the government ferry to carry them to the land of the free. 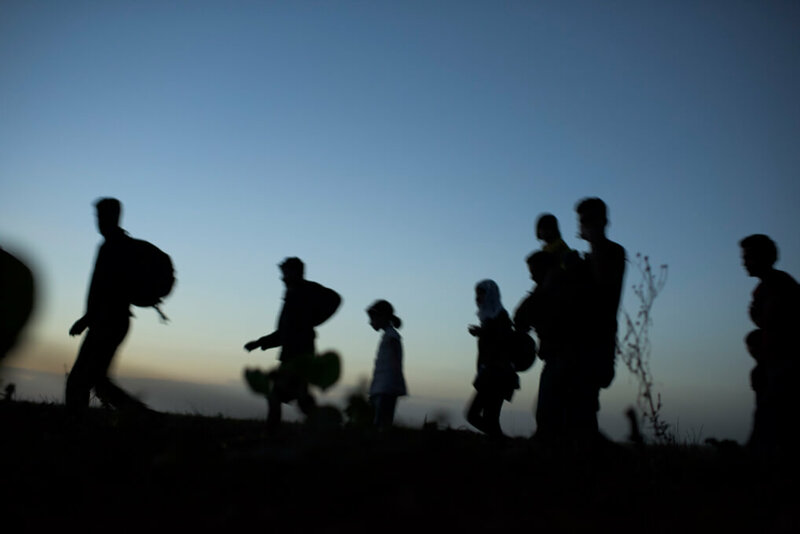 Right: Migrants walk through fields, circumventing official checkpoints, from the Serbian to the Croatian border on September 17, 2015. 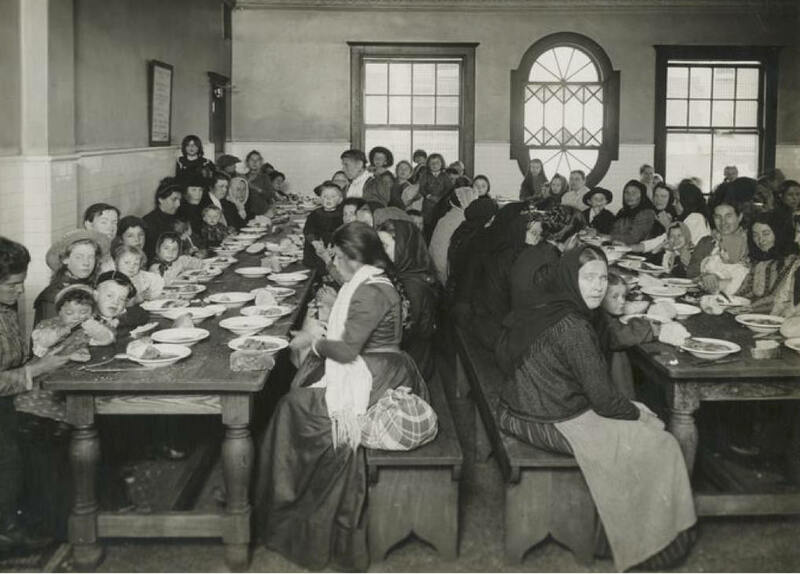 Left: 1902-1913: Uncle Sam hosts immigrants being served a free meal at Ellis Island. 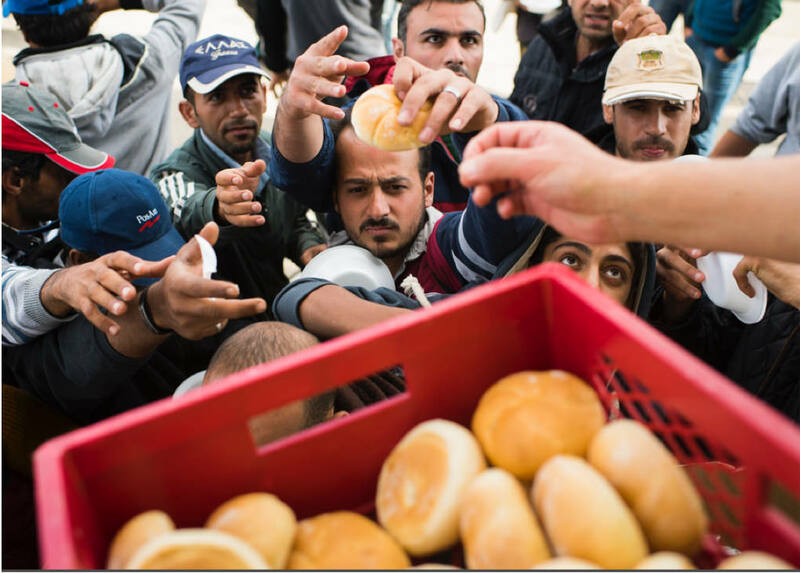 Right: Migrants receive food as they wait at the Slovenian border on September 20, 2015 near Hegyeshalom, Hungary. Left: A small boat carrying aliens to Ellis Island. Sometimes the number of immigrants waiting to be transferred was so great that they waited for several days and nights before the little ferry boat could bring them to land. Right: A migrant walks west of Sid, Serbia towards the Croatian town of Tovarnik on September 17, 2015. 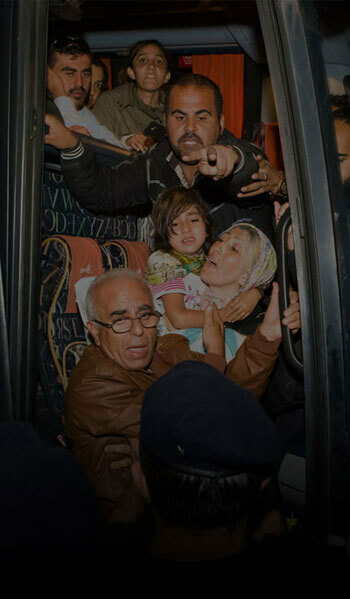 After being bussed to the border, migrants were directed by aid workers and police on a route that circumvented the official checkpoints of both nations. Left: 1902-1913 The pens at Ellis Island, main hall full of people who have passed the first mental inspection. 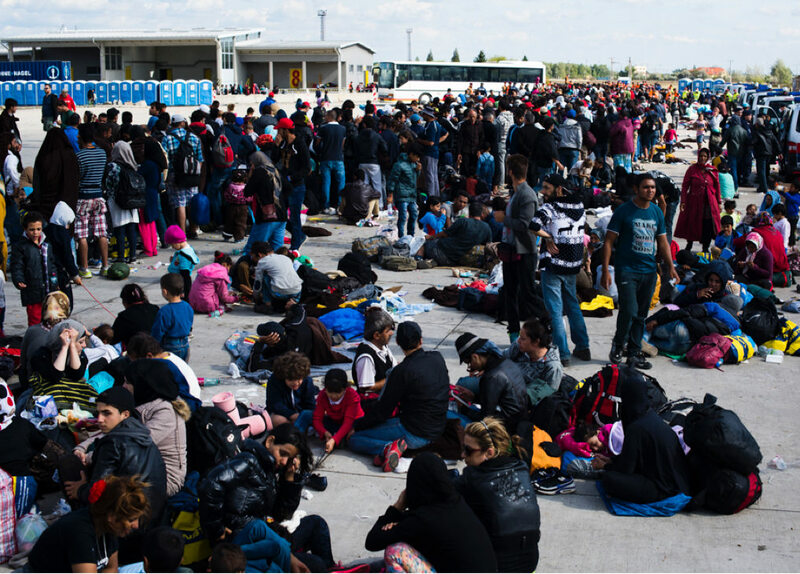 Right: Thousands of people wait in line to catch buses and taxis to Nickelsdorf, Austria where they will board trains bound for Vienna on September 20, 2015 near Hegyeshalom, Hungary. After walking from the nearby town's train station migrants waited for hours in this transit zone parking lot. There are more refugees in the world today than ever recorded and more than half of them are children. In 2014, 19.5 million people were forced to leave their homeland because of war, persecution or natural disaster. 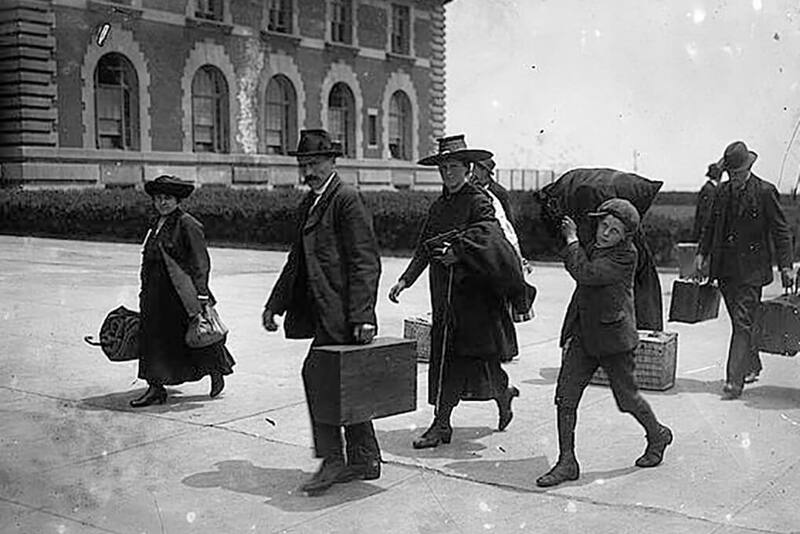 Although a century has passed since the first immigrants landed on Ellis Island, the United States remains a destination for over 121,000 people who applied for asylum or refugee status in 2014. 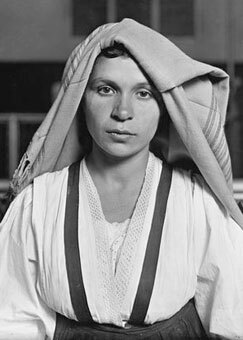 Capturing the faces of Ellis Island in the early 1900’s, photographer and sociologist Lewis Hine pushed for social reform through his images of newly arrived immigrants into New York. 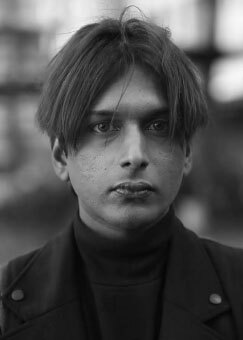 Today, photojournalist Danny Ghitis captures the stories of those who have left their homelands, and now call New York home. Your browser isn't support audio. Men pass away like falling walls! The hazy sun is covered by sombre clouds. Men pass away like falling walls! Deaths in one day are numberless, The hazy sun is covered by sombre clouds. The largest outbreak of the Ebola virus began in West Africa in 2014, unleashing a wave of fear across the globe. 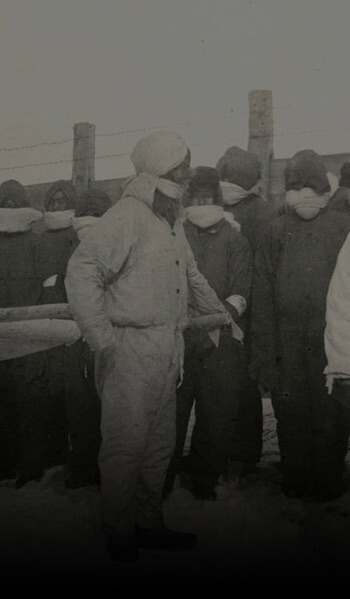 The outbreak lead to a worldwide mobilization to stop the spread of the disease. The death toll from Ebola as of September 22, 2015 stands at 11,311 with 28,355 reported cases. 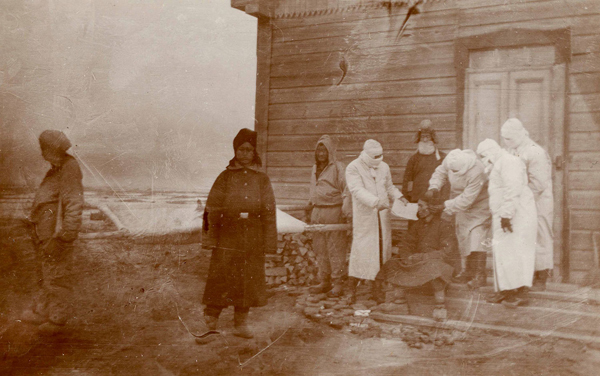 More than a century earlier, a similar global effort brought an end to the largest outbreak of the Bubonic Plague, which began in China and spread to nearly every continent. The Bubonic plague ultimately claimed the lives of 13 million people. 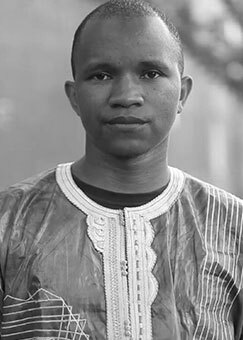 Paralleled alongside never before published photos of the Bubonic Plague from the Burns Archive are Getty Images Reportage photographer Daniel Berehulak&apos;s photos from his coverage of Ebola in Liberia. 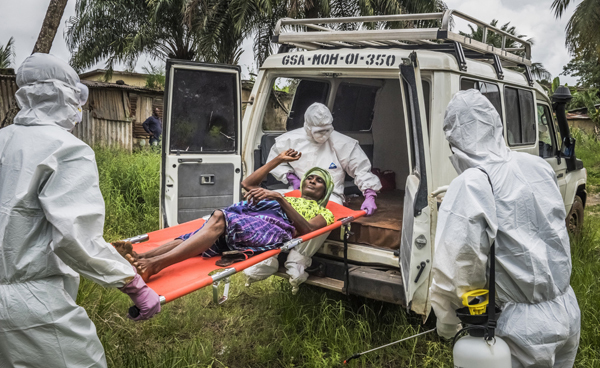 Marie Raedd is carried by health workers wearing protective clothing, into an ambulance to be taken with her mother to an Ebola treatment center in Monrovia on October 01, 2014. 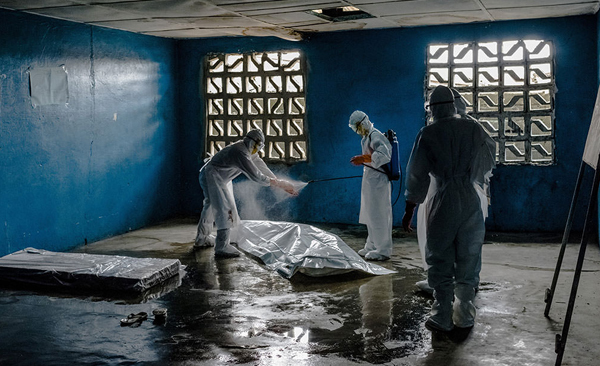 A Liberian Red Cross burial team wearing protective clothing are disinfected on August 28, 2014 in Monrovia, Liberia. The center, a closed primary school originally built by USAID, was being used to temporarily isolate people suspected of carrying the virus. 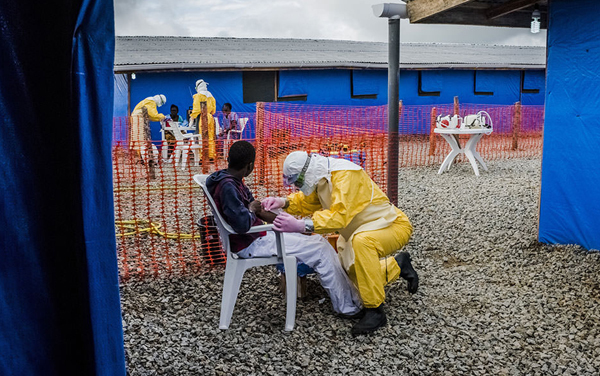 Doctor Steven Hatch, 45, dressed in protective clothing, draws blood from a patient suspected of having Ebola, to be sent to a mobile testing laboratory for an Ebola test, as he works in the high-risk suspected ward at the Bong County Ebola Treatment Unit, on October 6, 2014 in Suakoku near Gbarnga in Bong County, Liberia. The blood samples are collected from patients and sent to a US navy mobile testing laboratory based at Cuttington University, being used for Ebola testing. The Bubonic Plague slowly traveled for over 100 years spreading panic from British India, where quarantine measures provoked uprisings against colonial rule, to Hawaii where troops enforced a quarantine and torched infected buildings, all the way to San Francisco's Chinatown. The explosive outbreak of Ebola in 2014 generated a similar fear on a much shorter timeframe. 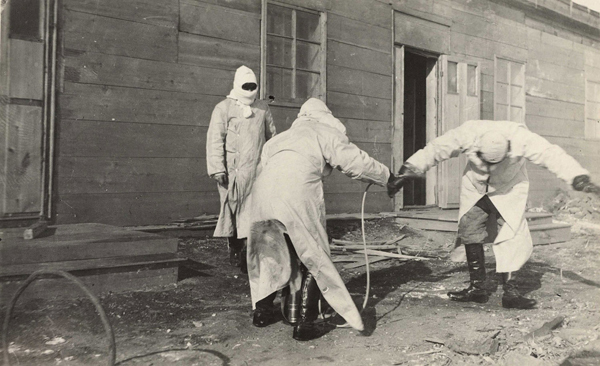 Starting in Guinea, the virus quickly spread to surrounding countries, and within six months had reached the U.S. and Europe. Starting in south central China in the 1850's, it reached the international hub of Hong Kong by 1894. 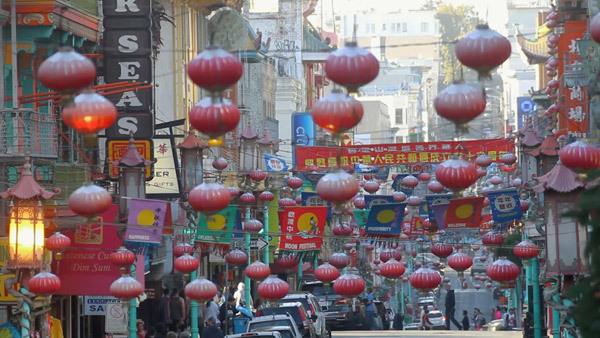 Commercial ships carrying rats harboring infected fleas spread the plague until it reached San Francisco’s Chinatown in 1900. This marked the first ever plague epidemic in the United States. The most common form of plague in humans, characterized by fever, delirium, and the formation of buboes. The outbreak of Ebola in 2014 began in West Africa, before being carried to Europe and the United States by returning aid workers. The U.S. saw four confirmed cases; one led to death. Today, Ebola remains a localized issue with the disease still present in Guinea and Sierra Leone. An infectious and generally fatal disease marked by fever and severe internal bleeding, spread through contact with infected body. The Plague - With Historian Dr. Stanley B. Burns from Courageous Studio on Vimeo. keeping them inside? Dr.Feng just said there are no new cases. There's no need for quarantine. Plague is carried by rats and fleas, you think your wooden barriers are keeping them inside? Dr.Feng just said there are no new cases. There's no need for quarantine. Throughout history, the medical world has constantly searched for new ways to numb pain. 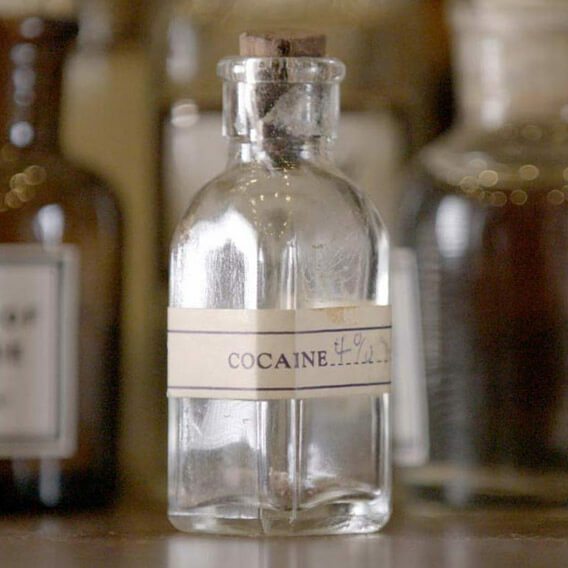 In the late 19th century, cocaine was discovered in medicine and first used as a form of local anesthetic.This new drug allowed doctors to perform surgeries that had never been tried before. Physicians soon saw that with the benefits came a long list of side effects including addiction. What was once an open market for cocaine and cocaine-infused products came to an end in 1914 as the federal government stopped the unregulated sale of the drug. The need to find innovative ways to dull pain continues today. In 1996, California allowed medical marijuana to be prescribed by doctors, opening up the opportunity for this controlled substance to bring relief to patients. Since then, 22 states have followed. 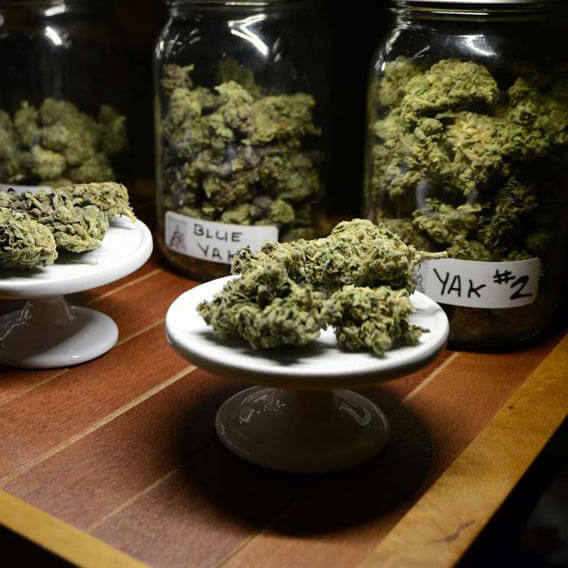 On January 1, 2016, New York will become the next state to allow the sale of medical marijuana. 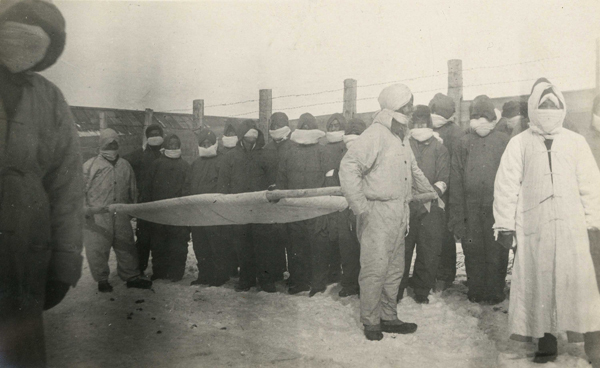 In the early 1900’s the U.S. imported between 600 and 1000 metric tons a year of raw cocaine in the form of coca. 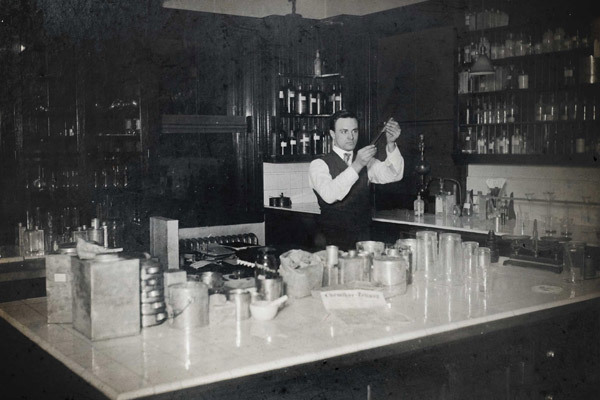 It was sold in a variety of tonics, elixirs and over-the-counter products. It was used to treat ailments ranging from toothaches and chronic pain to shyness, and to break morphine addicts of their habit. Today, medical marijuana has been used to treat everything from multiple sclerosis and epilepsy, to chronic pain and the nausea that follows chemotherapy. Despite relaxed state laws, the federal government continues to regulate marijuana as a schedule-1 drug, making it illegal to grow, possess and use anywhere in the United States. in 1904, which is the equivalent of roughly $6 today. today. The U.S. legal cannibus market hit $2.7 billion in 2014. At the turn of the 20th century cocaine was readily available for sale in pharmacies and was used in popular products such as soft drinks. 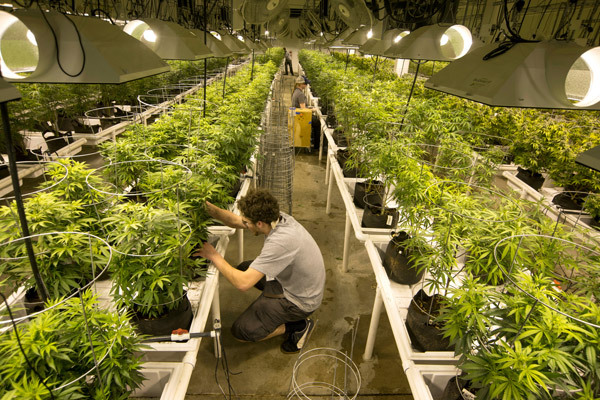 With the use of medical marijuana becoming increasingly normalized across the United States, growers are seeing a rise in demand across the country. By the late 1880's cocaine use was widespread in the U.S. 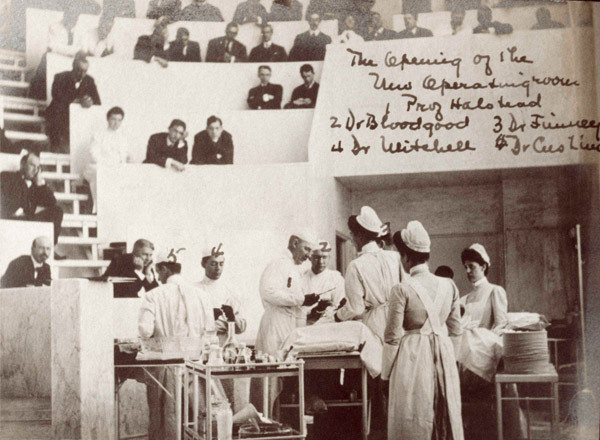 The eminent neurologist William Hammond was touting it in print and lectures, assuring audiences of its benefits as a surgical painkiller and a low-dosage pick-me-up that was no more addictive than coffee or tea. Druggist sold cocaine in cigarettes, cordials and soft drinks until 1900. By 1907, New York State had regulated cocaine, requiring a doctor's prescription. Dr. William Halstead was an early champion of the drug and its use in medicine. After many experiments both on patients and himself, he soon saw the side effects first hand as he suffered from addiction. 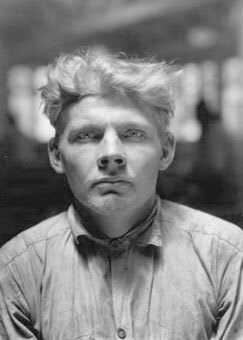 Sweeping violence and addiction led to the federal Harrison Act regulating government cocaine in 1914, and by the late 1920's cocaine had fallen out of favor except among the wealthy, Bohemian crowd. Amphetamines and heroin became the drugs of choice as prohibition swept America in the 1920's, and cocaine disappeared until it surfaced again in the 1970's disco era. By the end of 2014, an estimated 2.4 million Americans were using marijuana for medical purposes. While New York City waits for its first medical marijuana dispensaries to open, just across the river in New Jersey patients are benefiting from its medical use. Marta Portuguez who suffers from gastroparesis, fibromyalgia and intractable spasticity, says she's constantly in severe pain. She's tried many different pharmaceutical solutions from narcotic painkillers to newer synthetic drugs. For Marta, those other drugs have not worked. 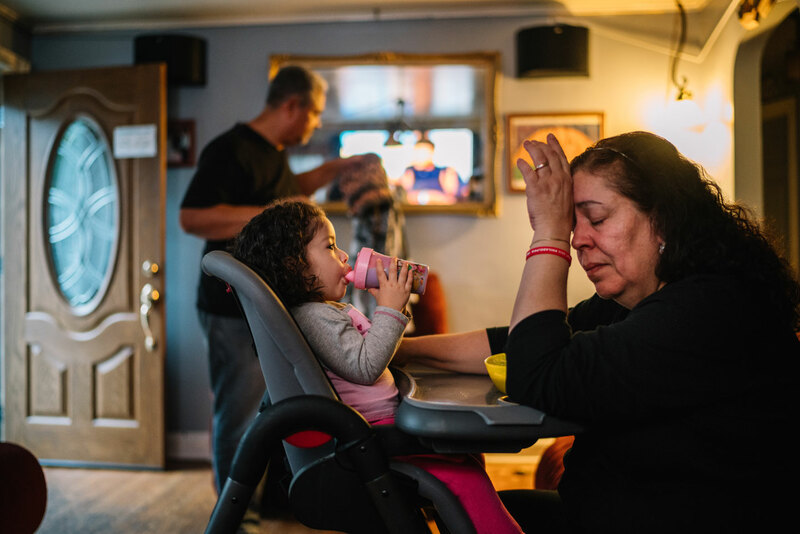 Every few weeks Marta, with the help of one of her family members, leaves her home and purchases medical marijuana from a dispensary in New Jersey. Her husband Rafael said she will need to stay in bed for upwards of a week to recover from a day of activity. 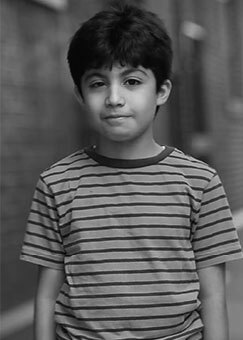 Do No Harm - A Story About Medical Marijuana from Courageous Studio on Vimeo. feeling like I'm dying is this medication. The complete, number one source of me not feeling like I'm dying is this medication. Marta Portuguez suffers from intense, chronic pain and exhaustion. Even holding her granddaughter Chloe requires fighting the constant pain. 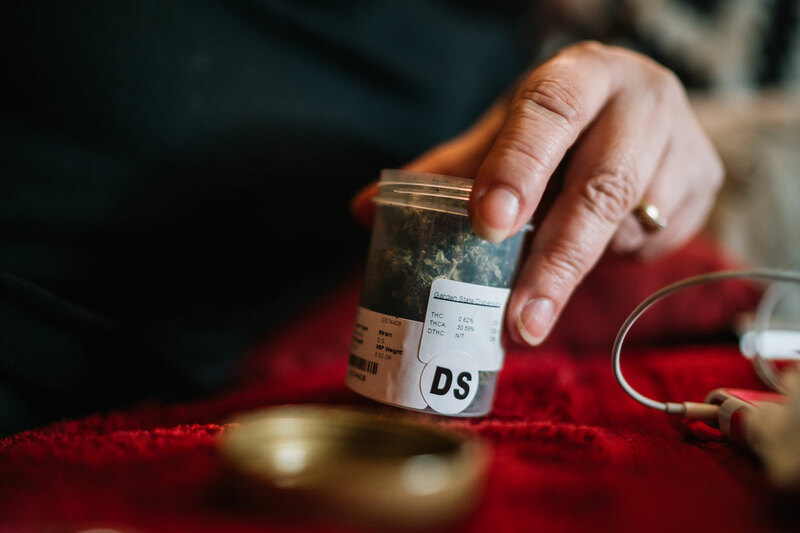 Medical marijuana offers her relief and lets her lower the doses of opioid painkillers and other pharmaceuticals that come with difficult side effects. Marta is still taking a number of narcotic pain medications although she said medical marijuana has allowed her to cut back considerably. 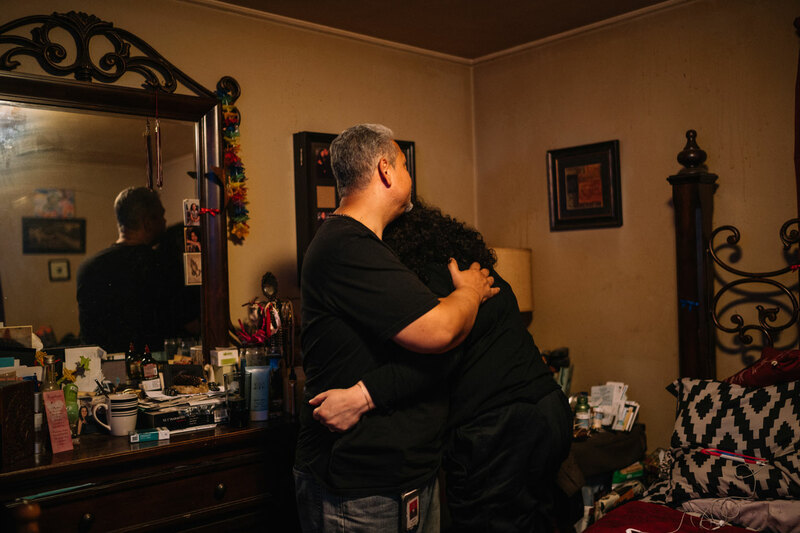 Marta's husband Rafael works full-time, and although he has a good job, it is still a struggle for him to pay for Marta's medication. The family all contributes to her care and expenses. We are a hospital…we need cocaine to exist. Sources: United Nations High Commissioner for Refugees, U.S. Center for Disease ControlThe Knick Special thanks to Drug Policy Alliance, New York Public Library, The Burns Archive, International Rescue Committee, The Ansob Center for Refugees, Scholars at Risk, Hias, Margaret Metzger and Emmett Brennan.